This blog has so far dealt with my weight gain, loss, gain and loss. I am interested in many other things and will also write about them, but weight has recently been weighing me down. It’s always been an endless cycle — one that I am determined to end successfully. My success will ultimately depend upon a very simple equation: Burning more calories than I consume. But it has never been easy and I will also have to overcome the reasons I overeat. To give me incentive to lose the 60-70 pounds I’ve gained in the past three years after working so hard to lose 100 pounds, I’ve joined some friends in a contest at the Muscatine Community Y. We formed a team, named it Project Body Slam and entered the contest Monday with more than 30 other teams of four people. Since Jan. 1, I have spent 340 minutes working out and burned 4,380 calories. I won’t have trouble making myself excercise during the two months of the contest and beyond. My challenge will be using discipline at the table. What worked for me three years ago was a mostly vegetarian diet. I ate three meals a day, made myself eat slowly and spend at least 20 minutes eating each meal. And I didn’t snack in between meals. Each meal had to contain a vegetable and (preferably) a whole grain. So far so good this week. I’m not going to keep a food journal and I’m not going to weigh food. I’m just going to use common sense and re-teach myself to eat when I’m hungry and not when I’m bored, angry, scared, anxious, frustrated, etc. If only it were as easy as the previous sentence makes it sound. Breakfast: Bowl of Cream of Wheat with some honey and trail mix mixed in, coffee and English muffin with organic peanut butter. Lunch: Tuna sandwich, steamed peas, bag of Fritos and an apple. 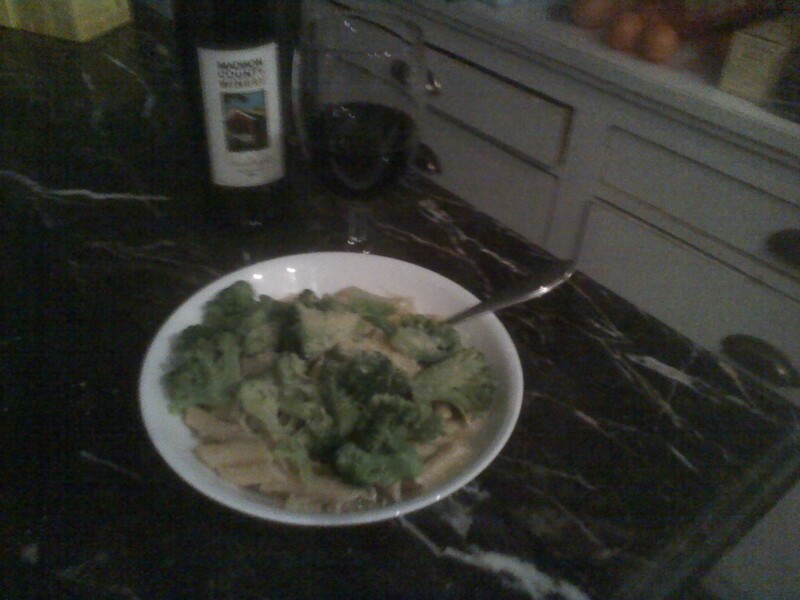 Dinner: (Pictured above) Pasta tossed with olive oil, onion, garlic, cannellini beans and steamed brocoli. I also had a glass of red wine. My excercise routine will include indoor biking classes, walking, weightlifting and Chicometrics and water aerobics classes at the Y. My plan is to exercise for at least an hour a day six days a week. And eat healthier. I also will be trying some other things (including this blog) in the next few weeks and I’ll tell you more about them later. 1. Win the contest at the Y. 2. Lose at least 50 pounds by July 25, when RAGBRAI begins. 3. Keep the weight off this time for good and make a healthier lifestyle permanent. Just a quick additional comment: Ate the leftover pasta today for lunch. It was even better today. I’m definitely going to make it again.